MS Excel stands for Microsoft Excel. Microsoft Excel is a spreadsheet developed by Microsoft for Windows, macOS, Android and iOS. It features calculation, graphing tools, pivot table, and a macro programming language called Visual Basic for Applications. It has been a very widely applied spreadsheet for these platforms, especially since version 5 in 1993, and it has replaced Lotus 1-2-3 as industry standard for spreadsheets. MS Excel is a part of Microsoft Office. There are many MS Excel version shows on the official site of ms excel on internet like Excel 2002, Excel 2003, Excel 2007, Excel 2010, Excel 2013 and Excel 2016 but the latest version of the MS Excel is MS Excel 2016(Excel 2016 Version 16.0). All the versions of MS Excel have their own specific function. *Do you know: Microsoft released the first version of Excel for the Macintosh on September 30 1985, and the first Windows version was 2.05 in November 1987. Microsoft Excel has the basic features of all spreadsheets, using a grid of cells arranged in number rows and letter-named columns to organize the data manipulations like arithmetic operations. It has a battery of supplied functions to answer statistical, engineering and financial needs. In addition, it can display data as line graphs, histograms and charts, and with a very limited three-dimensinal graphical display. It allows sectioning of data to view it dependencies on various factors for different perspectives (using pivot table and the scenario manager). It has a programming aspect, Visual Basic for Applications, allowing the user to employ a wide variety of numerical methods, for example, for solving differential equations of mathematical physics, and then reporting the result back to the spreadsheet. It has also has a variety of interactive features allowing user interfaces that can completely hide the spreadsheet for the user, so the spreadsheet presents itself as a so-called application, or decision support system (DSS), via a custom-designed user interface. An Excel application can automatically poll external databases and measuring instruments using an update schedule, analyze the results, make a Word report PowerPoint slide show, and e-mail these presentations on a regular basis to a list of participants. Excel was not designed to be used as a database. In MS Excel, the starting of any program may contains many of different features by which we can do our work easier, simpler, faster and give a new way or we can say direction to our work with new features of that program. All the program have a different features in its own and as well as MS Excel also may contains various features of working procedure and criteria of its own. As we make any app, program or any function for our use, we first add some useful features it and after we add more additional features to it and doing our program update by adding more various features to it. Similarly, MS Excel was first made in 1993, the first version is Excel 5. Nowadays, MS Excel is become a totally upgraded app for the users and the top upgraded form is Excel 2016. Excel 2016 has 484 functions of these, 360 existed prior to Excel 2010. Microsoft classifies these function in 14 categories of the 484 current functions, 386 maybe called from VBA as methods of the objects "WorksheetFunction" and 44 have the same names as VBA functions. VBA stands for Visual Basic for Application. The Windows version of Excel supports programming through Microsoft's Visual Basic for Application (VBA), which is a dialect of Visual Basic. Programming with VBA allows spreadsheet manipulation that is awkward or impossible with standard spreadsheet techniques. VBA was removed from Mac Excel 2008, as the developers did not believe that a timely release would porting the VBA engine natively to Mac OS X. VBA was restored in the next version, Mac Excel 2011, although the build lacks support for ActiveX objects, impacting some high level developer tools. A common and easy way to generate VBA code is by using the Macro Recorded. The Macro Recorder records actions of the user and generates VBA code in the form of a macro.The macros can also be linked to different trigger types like keyboard shortcuts, a command button or a graphic. The VBA code of the macro can also be edited in the VBE. Certain features such as loop functions and screen prompt by their own properties, and some graphical display items, cannot be recorded but must be entered into the VBA module directly by the programmer. Macro Recorded code may not be compatible with Excel versions. Come code that is used in Excel 2010 cannot be used in Excel 2003. Making a Macro that changes the cell colours and making changes to other aspects of cells may not be backward compatible. The first version of Excel supported end user programming of macros (automation of repetitive tasks) and user defined functions ( extension of Excel's built--in function library). In early versions of Excel these programs were written in a macro language whose statements has formula syntax and resided in the cells of special purpose macro sheets. XLM was the default macro language for Excel though Excel 4.0. Beginning with version 5.0 Excel recorded macros in VBA by default but with the version 5.0 XLM recording was still allowed as an option. After 5.0 version, all that version are discontinued. All versions of Excel, including Excel 2010 are capable of running an XLM macro, though Microsoft discourages their use. 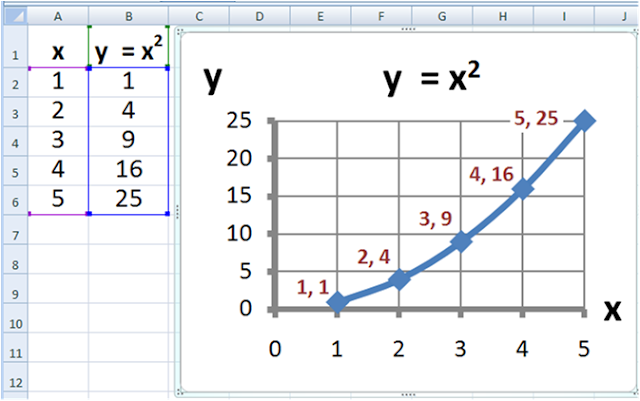 Excel supports charts, graphs or histograms generated from specified groups of cells. The generated graphic component can either be linked within the current sheet, or added as a separate object. These displays are dynamically updated if the content of cells change. For example, let us suppose that we want a important design requirements are displayed visually; then, in response to a user's change in trial values for parameters, the curves describing the design change shape, and their points of intersection shift, assisting the selection of the best design. As we know above, for the first edition of excel there are many version of Excel up to 7.0 had a limitation in the size of their data sets of 16k (16,384) rows. Version 8.0 to Version 11.0 contains 64k (65,536) rows and 256 columns. Version 12.0 have 1M (1 048 576) rows and 16384 columns. Microsoft originally marketed a spreadsheet program called Multiplan in 1982. Multiplan became very popular on CP/M systems, but on MS-DOS systems it lost popularity to Lotus 1-2-3. Microsoft released the first version of Excel for the Macintosh on September 30, 1985, and the first Windows version was 2.05 (to synchronize with the Macintosh version 2.2) in November 1987. Lotus was slow to bring 1-2-3 to Windows and by the early 1990s Excel had started to outsell 1-2-3 and helped Microsoft achieve its position as a leading PC software developer. This accomplishment solidified Microsoft as a valid competitor and showed its future of developing GUI software. Microsoft maintained its advantage with regular new releases, every two years or so.